SEOUL, South Korea — Few people in the world were more surprised and disappointed by the breakdown of the summit meeting between President Trump and North Korea’s leader, Kim Jong-un, on Thursday than President Moon Jae-in of South Korea. Mr. Moon had been so confident of a breakthrough in the meeting in Hanoi, the Vietnamese capital, that he planned to deliver a major speech on Friday laying out his bold vision for economic cooperation with North Korea, assuming that a denuclearization deal between Mr. Trump and Mr. Kim would lift restrictions on joint inter-Korean economic ventures. That dream suffered a major setback as Mr. Trump and Mr. Kim abruptly ended their meeting, unable to bridge their differences. Mr. Kim wanted Mr. Trump to remove sanctions, the most potent leverage Washington had to force North Korea to denuclearize. But what he offered the president in exchange was limited to the dismantlement of a single nuclear complex. 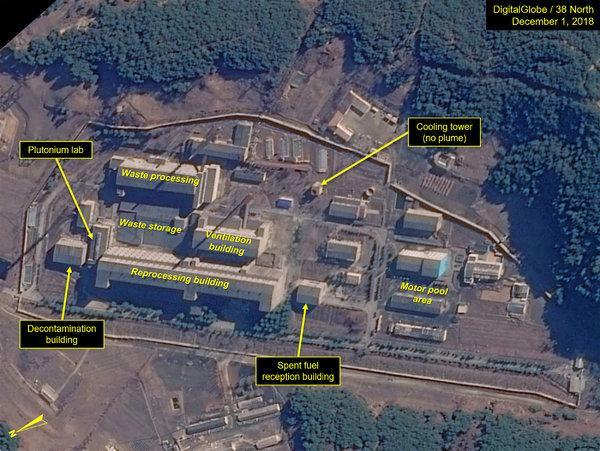 Although that complex, Yongbyon, houses facilities that produce plutonium and uranium fuel for nuclear bombs, it is not the only nuclear facility in the North. The country is widely believed to run at least one clandestine uranium-enrichment plant. The dismantlement of Yongbyon also would not affect the nuclear warheads, long-range missiles and fissile materials the country has already produced. 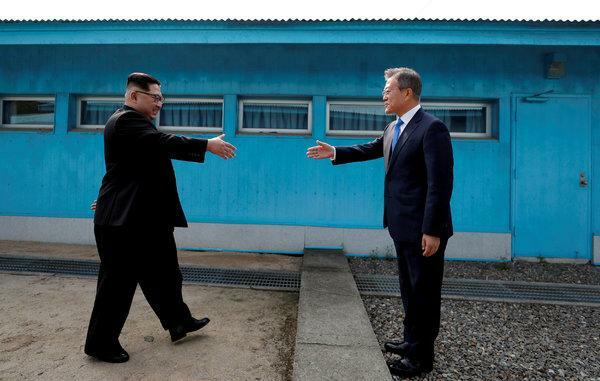 Mr. Kim and Mr. Moon met last April at Panmunjom, inside the Demilitarized Zone separating their countries. Mr. Kim and Mr. Moon met last April at Panmunjom, inside the Demilitarized Zone separating their countries. Mr. Trump called Mr. Moon from Air Force One as he flew back to Washington to explain what had happened, and asked him to continue to act as a mediator between him and Mr. Kim, Mr. Moon’s office said. The collapse of the Hanoi summit meeting was especially painful for Mr. Moon. If Mr. Kim and Mr. Trump return to the personal insults and threats of “fire and fury” and nuclear annihilation they exchanged in 2017, it would be the end of the rapprochement Mr. Moon has painstakingly helped to build. 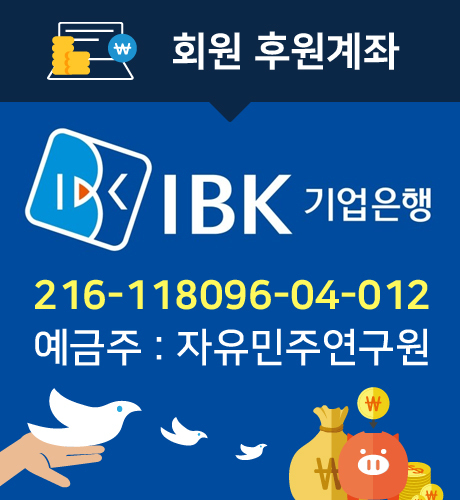 With his approval ratings falling over South Korea’s stubborn economic troubles, Mr. Moon has hoped to recover some of his popularity by jump-starting his signature policy of helping to advance the North’s denuclearization and improving inter-Korean ties. That depended on Mr. Trump and Mr. Kim striking a denuclearization deal in Hanoi significant enough for Washington and the United Nations to ease sanctions and create room for Mr. Moon to push his ambitious plans for economic cooperation with North Korea. Now, Mr. Moon faces criticism that he has been too optimistic and naïve, overselling North Korea’s willingness to denuclearize. “South Korean conservatives will intensify their criticism of President Moon’s engagement policies for going too far, too fast with North Korea,” said Leif-Eric Easley, a professor of international studies at Ewha Womans University in Seoul. Mr. Trump and Mr. Kim in Hanoi, Vietnam, on Thursday. They abruptly ended their meeting after they were unable to bridge their differences. 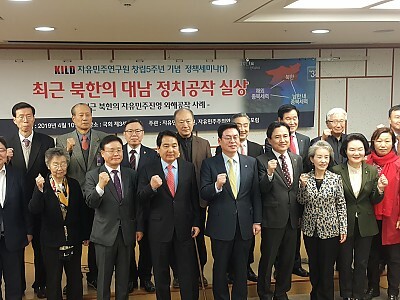 Hwang Kyo-ahn, head of the main conservative opposition Liberty Korea Party, said on Thursday that Mr. Moon’s government had been deceiving the people with a “rosy illusion.” Since he took office in 2017, Mr. Moon has staked his political fortune on successfully mediating a denuclearization deal between Mr. Kim and Mr. Trump. 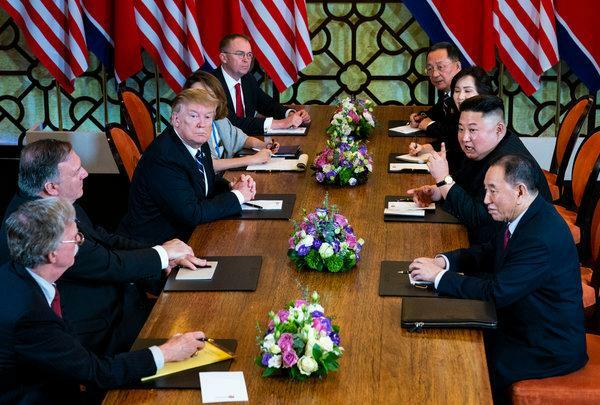 He met with Mr. Kim three times last year and helped broker his Hanoi meeting with Mr. Trump, as well as the two leaders’ first meeting in Singapore last June. He has tirelessly sold Mr. Trump on the merits of negotiating with Mr. Kim, saying that the North Korean leader has made a strategic decision to give up his nuclear weapons and focus on rebuilding his country’s economy should Washington take corresponding actions, such as easing sanctions. Activists and North Korean refugees protesting the Vietnam summit meeting in Seoul on Tuesday. Mr. Moon faces criticism that he has been too optimistic about North Korea’s willingness to denuclearize. In recent months, older, more conservative South Koreans have rallied in central Seoul, accusing Mr. Moon and Mr. Trump of endangering their countries’ alliance, particularly over their decision to suspend joint military exercises even when North Korea has not given up a single nuclear warhead. On Thursday, Mr. Trump defended the decision, calling the joint war games too expensive, and said that Mr. Kim had promised to stick to his moratorium on nuclear and missile tests. Analysts have long warned that Mr. Moon’s betting on cooperation between Mr. Kim and Mr. Trump leaves South Korea exposed to the whims of the two unpredictable leaders. “This outcome has been expected, given the impulsive and unpredictable nature of Trump and Kim Jong-un,” said Yoo Dong-ryul, a conservative analyst who leads the Korea Institute for Liberal Democracy in Seoul. 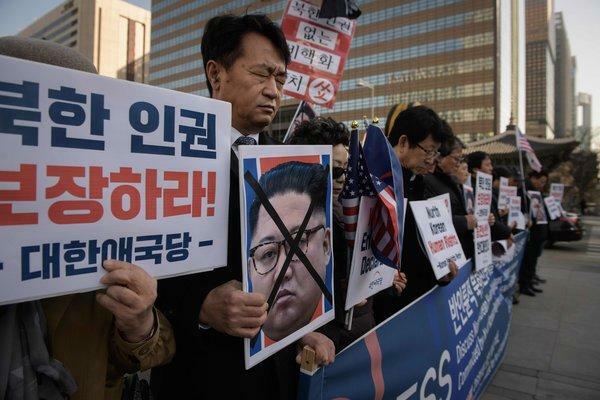 Washington wanted North Korea to take serious and verifiable “big-bite” steps toward denuclearization, and feared that lifting sanctions too soon would allow the country to drag its feet and establish itself as a de facto nuclear power. But Pyongyang’s top priority was sanctions relief, considering it proof that Washington was ready for peace and the “new” relations that Mr. Trump promised in Singapore. Analysts had warned against holding a second summit meeting without first sorting out the differences through working-level negotiations. Mr. Trump’s abrupt decision must have shocked Mr. Kim, who might have seen Mr. Trump as desperate for a deal even though the president had repeatedly said he was in “no rush,” analysts said. But Mr. Trump’s decision comforts people in South Korea and Japan who had feared that he might have settled for only freezing the North’s nuclear program or removing its intercontinental ballistic missiles, the most immediate threat to the Americans, leaving the country with short- and medium-range missiles and their nuclear warheads. 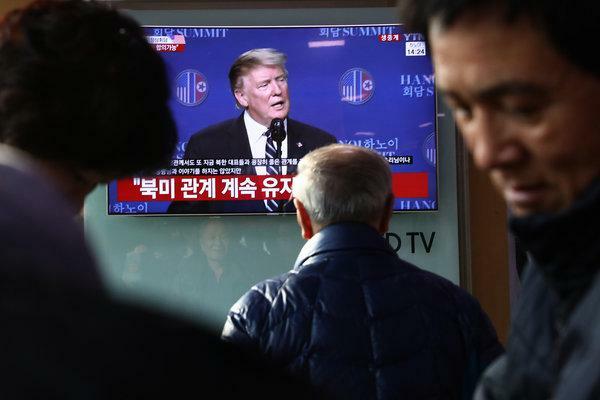 “Trump left the negotiating table, basically telling Kim Jong-un that they will meet again when North Korea is ready to give up its nuclear weapons,” said Cheon Seong-whun, an analyst at the Asan Institute for Policy Studies in Seoul. “It must have been a blow to Kim Jong-un.” analysts also said the collapse of the talks in Hanoi could ultimately lead to a better deal with North Korea. 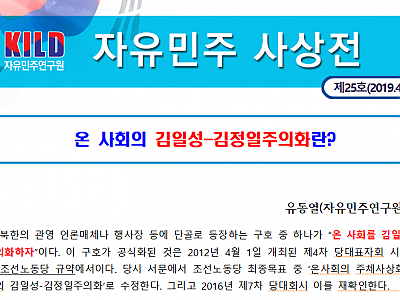 A version of this article appears in print on March 1, 2019, on Page A12 of the New York edition with the headline: South Korea’s Leader Planned on Breakthrough, Not Breakdown.